The first step in determining the layout of APs begins with assessing both the uses of the network and the environment in which it will be used. Because the users and devices will have different needs, a network in a warehouse will be very different from a network deployed in a bustling office space. Before starting the site survey and design stage, the engineers should fully understand the expected uses of the network, anticipated client types, user count, size of the facility, and knowledge of particular construction that can affect both signal propagation and installation of the access points. Once the basic requirements of the network and the details of the environment have been determined, the AP placement design can begin. There are many basic guidelines and best practices for various scenarios, which together will lead to more efficient networks and better performance. Listed below are just a few examples of best practices. According to manufacturer instructions and designs, APs are most commonly mounted below the ceiling with the wires running above. Compared to ones mounted above a ceiling, access points mounted below a ceiling will perform better because their signals will not be affected by surrounding ducting, power cables, and other building construction. Additionally, the areas below ceilings are generally cleaner and climate controlled which will boost the operational life of the access points. Above ceiling: This heat map shows the coverage and speed test results after mounting a Cisco3602i access point above the ceiling tiles. 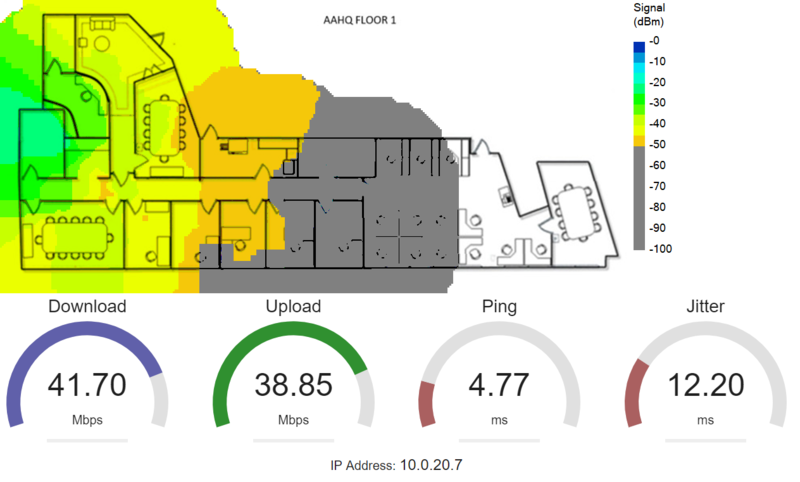 Below ceiling: This heat map shows the coverage and speed test results of placing the same access point in the same location but mounted below the ceiling tiles. Another common best practice is to place access points inside offices or rooms rather than in hallways. This can provide more efficient coverage as well as a better signal closer to where devices are in use. In areas such as open cubicle spaces, APs can be placed in a staggered, honeycomb pattern to provide ideal coverage and minimal interference/overlap issues. For security and efficiency reasons, APs are typically not mounted too close to outside walls, as the cell, or the area that an access point’s signal will reach, will extend outside of the user’s environment. In addition to being inefficient, this can be a potential security concern as outsiders can easily see and access the network without physically entering the facility. 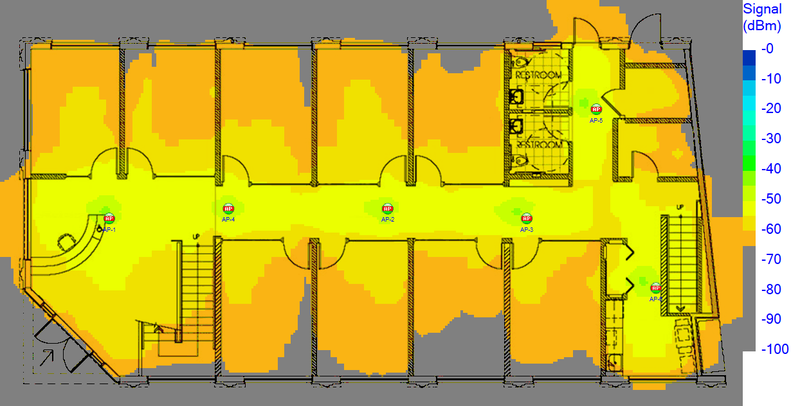 The following pictures are from AirMagnet Survey Planner and demonstrate the differences in signal coverage when placing the same access point in a hallway compared to inside individual offices. The main difference can be seen in how much of the office the signal covers when the AP is placed inside the room. 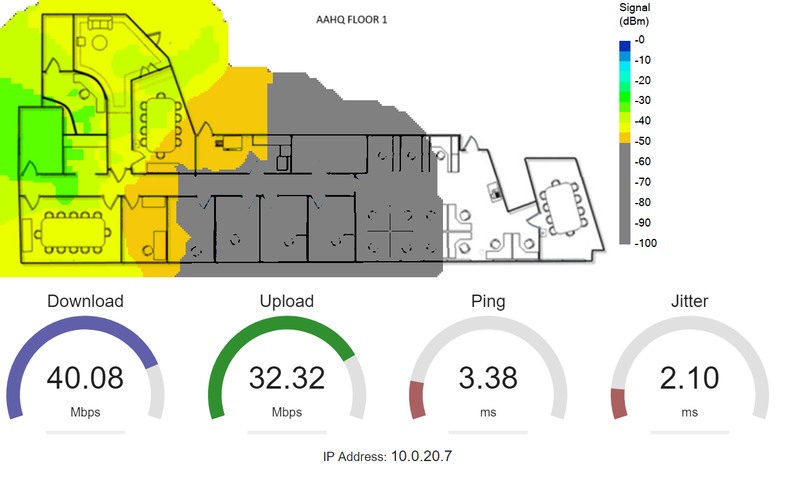 APs in hallway: As seen in this heat map, the signal strength is weaker in each office when the APs are mounted in the hallway. 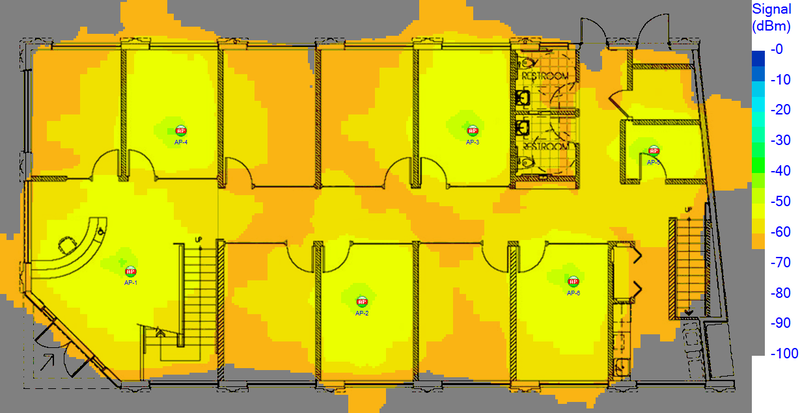 APs in offices: This heat map illustrates strong signal strength in the rooms where APs have been mounted. For areas that will see large numbers of users and devices, such as conference or training rooms, more access points will most likely be needed because of the increased number of devices connecting to the network. A high density of devices can be too demanding for a normal spread of access points. Therefore, sometimes large meeting rooms will need multiple access points installed. Per vendor recommendation, each access point can support roughly 25-30 clients with each client connecting several devices, including computers, cell phones, and tablets, to the network. Using industry recommended metrics, it is easy to estimate the number of required APs for a high density venue such as a stadium. For example, a large sports stadium with a rectangle shaped bowl that seats 80,000 spectators has the following dimensions: 650 feet x 750 feet (487,500 square feet). Assuming each access point covers 1,600 square feet, 305 access points are needed for this stadium’s wireless network. However, the better way to estimate the number of necessary APs is to determine the user count. Assuming that only 50% (40,000) of the spectators will connect to the WiFi, we can estimate that about 25% (10,000) are actively using the WiFi at any given time. With 30 users per access point, about 334 APs are needed for a stadium with a capacity of 80,000. Compared to an office building, larger spaces, such as auditoriums or cafeterias, are built differently and will likely require different AP layouts. High ceilings and thicker wall material can necessitate other placement options. In these cases, it is possible that the use of directional antennas might be required due to the fact that most omni-directional antenna cells cannot cover enough vertical distance. It is important to understand that an AP mounted to a high ceiling will not work the same as one mounted on a ceiling with a normal height. 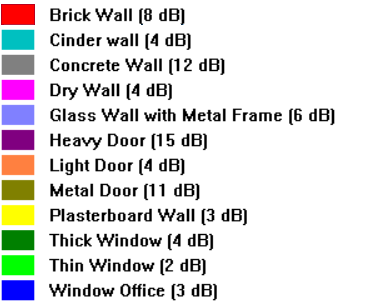 Building materials: This table from AirMagnet Survey Planner provides a general idea of how various materials can affect signal strength. 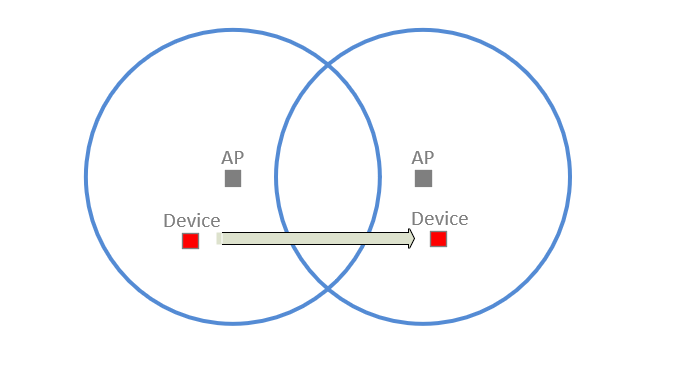 When planning the AP layout for a network, it is important to bear in mind that the coverage cells of the access points will most likely overlap with others. While there generally should be some overlap, how much will depend on the intended use of the network. Typically, roaming and location based services will require more overlap than networks that do not require these services. However, too much overlap can lead to increased interference if the overlapping APs are transmitting on the same channel. Coverage overlap: When there is signal overlap, a device can travel between these signals with minimal interruption. When a wireless network is designed with efficiently placed access points, it can be expected to perform significantly better than a network that did not plan for optimal AP placement. The coverage will be distributed better, data rates will be higher, and users should have fewer complaints. Additionally, the network will be less vulnerable to environmental conditions and even more resistant to attacks. With a good access point layout, a wireless network is better equipped to provide effective service for all of its users.